An avid baseball fan, Mark has enjoyed watching minor league baseball games in Connecticut for over a decade. Mark especially enjoys going to New Britain Rock Cat games. The Rock Cats, (the AA farm team of the Minnesota Twins) play in the Eastern League. Over the years, the Eastern League has been host to top prospects such as Alfonso Soriano, David Ortiz, Dustin Pedroia, Ryan Howard, David Wright, Justin Morneau and Joe Mauer. 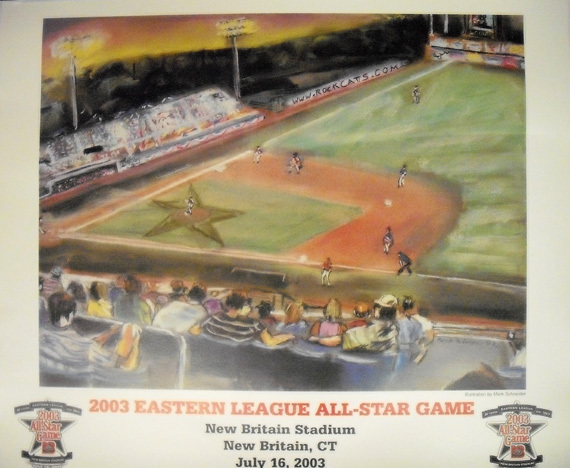 In 2003, the New Britain Rock Cats hosted the Eastern League All-Star Game. I illustrated the official poster for the All-Star game (see below). The game included players such as Grady Sizemore, Chien Ming Wang, Kevin Youkilis, and Alex Rios during the 2003 season.